Summer is the season most students look forward to, not just because it’s when they stop having daily classes and finally get some rest, but also because it’s the perfect time to have fun with lots of interesting plans. It’s also one of the seasons when most foreign students come to Spain with the aim of learning Spanish, and even though they keep studying during some of the year’s hottest days, they can also try many activities through their language schools. Spanish students can find a wide variety of plans and activities to carry out during the summer time while they keep studying Spanish and improve their language skills. One of the first summer activities offered by language school Costa de Valencia, will take place during the night of San Juan, when students will have a great time celebrating this special night at the Malvarrosa Beach. Bonfires by the seaside and an all-night party… That’s how summer starts. 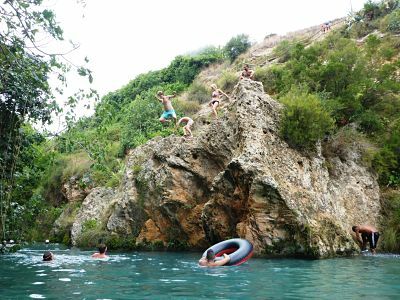 In July, students can visit Denia to experience its popular Bous a la Mar festivities, where bulls run towards the water, and the excursion will continue with an exciting hiking session to discover Cova Tallada, an impressive limestone cave in Jávea that offers amazing views of the sea (https://youtu.be/lUpBnVGiLh4).Also in July, another excursion will take students to Picassent, which is a common destination for Spanish language schools in Valencia. They’ll enjoy the atmosphere of the festivities while taking a typical almuerzo, and the activity will end preparing a traditional paella between all the students. During August, all of the Spanish students at the school will be able to enjoy 3 interesting activities at their disposal. 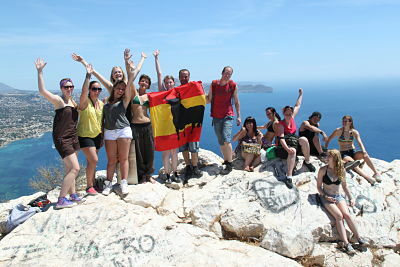 First of all, a hiking trip will let them discover the impressive Cliffs’ Path, from Cala Moraig to Cala Llebeig, in order to enjoy great landscapes (www.facebook.com/COSTAdeVALENCIA/videos/10154824590570942/). The next plan will take students to the cozy town of Anna, south of Valencia. They’ll visit Palacio de los Condes de Cervellón there, commonly known as the Valencian little Alhambra palace, which was built almost 8 centuries ago over the ancient Castle of Anna, and then they’ll continue to the Gorgo de la Escalera, a natural canyon filled with refreshing crystal-like water. August’s last activity will let students experience la Tomatina de Buñol (https://youtu.be/BGnFjTyTbqQ),a famous festival known all around the world, having a snack before entering the popular tomato battle. Lastly, even though September marks the end of summer, it doesn’t mean it’s the end of the activities planned by language schools (www.costadevalencia.com/english/cultural-sports-and-free-times-activities). Students at Costa de Valencia will enjoy the festivities of Jávea, the Entrada de toros y caballos in Segorbe, or the festivities in Peñíscola, with its popular and colorful Moros y Cristianos parades. All of these excursions, besides the wide range of plans during the rest of the year, make Valencia a great destination for those who want to learn Spanish and get involved with the local culture.